Never before has an issue involved every single human being on this planet, and never before has the window for action been so short. The climate movement can’t be compared to any other social movement in history. Here’s why it’s unprecedented and why we need new strategies to transition from the current climate movement of the few to a vibrant worldwide movement of the many. Second, the climate movement challenges human nature. Past social movements have focused on immediate and visible injustices. People fought against the here and now for a better tomorrow. That model of activism is consistent with human nature: we are creatures of immediate benefit and short-term thinking. But climate change is a completely different animal. Yes, global warming is having an undeniable and tangible effect on people’s lives. But by the time enough people–especially in the US–have experienced enough of the consequences to be compelled to action, it will be too late to mitigate the effects of rising planetary temperatures. Therefore, fighting climate change means fighting something that is abstract now but will be real later. This requirement defies the deep pull of human nature. It is antithetical to our normal ways of thinking and acting. This is new territory. There is no parallel in human experience. Third, past social movements have largely relied on the active participation of those affected to push for change. But with the climate movement, we’re not talking about injustices against one age group, region, gender, sexual orientation, or race. Every single person on Planet Earth is or will be affected. A social movement cannot expect every individual–with their varying passions, interests, perspectives and capabilities–to join the cause. We can't expect everyone to devote time and energy to organizing for climate efforts. This is where new strategies and tactics are vital. 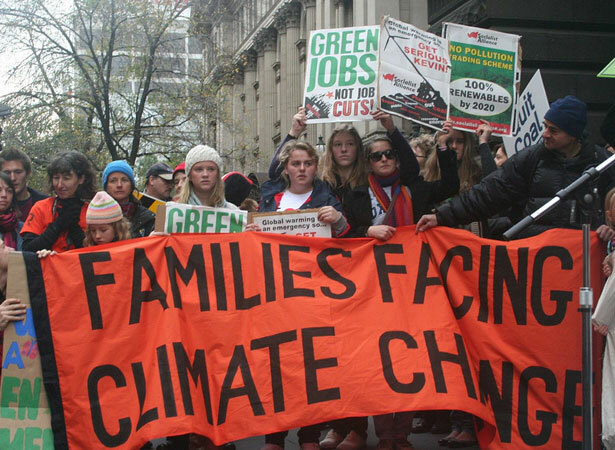 Climate activists must provide wide ranging opportunities for others to take action. Our passion is fighting climate change, but we have to recognize that not everyone is prepared to give the same amount of time and effort. We can structure our campaigns so that others can donate as much or as little time as they are able, while still having a meaningful impact. For example, we develop the networks, and then we call on people to come out for a one-hour rally. Or instead of exhorting people to put solar panels on every building, we can start non-profits that install solar panels and provide free solar energy educational curricula for schools. Fourth, since the climate movement encompasses every single person, individualized messaging is essential. Each person will connect to climate issues for different reasons: social solidarity, real estate values, love of nature, concern for their children, uncertainty about food and water sources….the variety of motives is endless. Activists can’t rely on a one-size-fits-all rationale. Climate activists need to think inclusively and connect climate change to what others care about, showing how the skiers, farmers, property owners, human rights activists, health providers, poverty advocates, and every interest group has some way in which their immediate concerns are linked to global warming. That is how the movement will grow as it learns to accommodate each voice on the planet. We’re in uncharted territory. Ironically, our most important lesson from history is that we cannot rely on historical precedent. We are forging a new movement, and we have to do it in a new way. Chloe MaxminTwitterChloe Maxmin is a climate activist and fellow at The Nation. She has received national and international recognition for her activism, including being named a “Green Hero” by Rolling Stone, receiving the Brower Youth Award, and appearing on Real Time with Bill Maher. For more information, visit chloemaxmin.com.